"And that was just the beginning! Headquarters only got more crowded from there." Memorable Moment - I never got around to seeing Inside Out last year, but now that I've watched it I can't believe I waited so long. It's such a great film! It made me laugh and cry. I thought it was adorable. Visually it is stunning, with lots of bright colours and fantastic animation. And the voice actors did such great work. I enjoyed it immensely. I loved all the colours during this opening sequence - Joy herself is glowing bright gold and all of the joyful memories that Riley creates are little gold orbs. Likewise, Sadness is blue, Disgust is green, Anger is red, Fear is white. I especially liked the way each memory orb that Riley creates during her day is accumulated until she goes to sleep at night, and then they are quickly sent off via a suction tube to long-term memory for storage. That's a very creative way to show a process that does indeed happen in our brains every day. 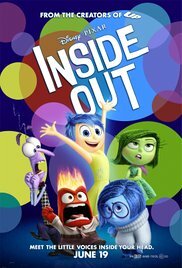 For me, this is the beauty of Inside Out - the movie takes this complicated thing called life and breaks it down into emotions and personality 'islands' and memory orbs; simple ideas to symbolise the magnificence of being alive.